Who can resist Pad Thai? This recipe is a home-made vegetarian version of the much loved Thai dish. It has all of the sweet, sour, salty and spicy flavors that you crave – and you don’t have to leave the house to enjoy it! Mix together in a bowl, tamarind paste, soy sauce, brown sugar, and Sriracha, stirring until sugar has dissolved. Prepare the rest of your ingredients, so that you can quickly add them to the hot pan. Cut tofu into 1-inch cubes and pat very dry. Heat oil in wok over medium heat until hot, then add shallots and sautee until golden-brown. Remove to a bowl. Add oil if needed and add tofu in 1 layer, gently turning occasionally, until golden, 5 to 8 minutes. Transfer tofu to paper towels using a slotted spoon. Add to the bowl with the shallots. Lightly beat eggs with 1/4 teaspoon salt. Heat 1 TBS oil in wok over high heat until it shimmers. Add eggs and swirl to coat side of wok, then cook, stirring gently with a spatula, until cooked through. Break into chunks with spatula and transfer to the bowl with the tofu and shallots. Add more oil and stir-fry scallions, garlic, about 1 minute. Add noodles and stir-fry over medium heat for 3 minutes. Add ingredients in bowl (tofu, shallots and eggs) and bean sprouts, and 1 1/2 cups sauce and simmer, turning noodles over to absorb sauce evenly, until noodles are tender, about 2 minutes. Stir in additional sauce if desired and transfer to a large shallow serving dish. 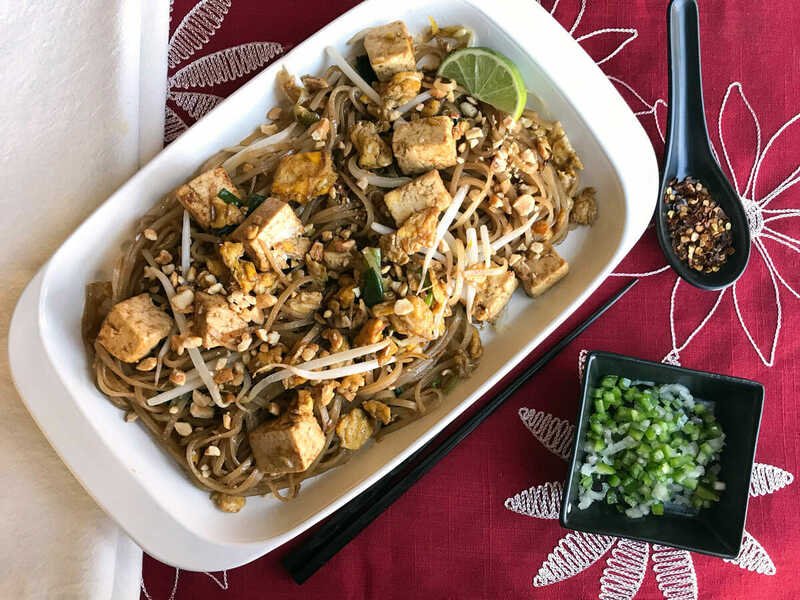 Sprinkle pad Thai with peanuts and serve with lime wedges, cilantro sprigs, and Sriracha.